Delighted East Fife players after Aaron Dunsmore's winner on Saturday. Pic by Kenny Mackay. 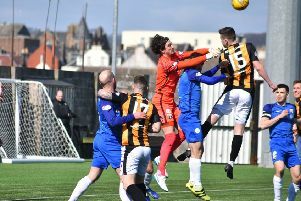 Darren Young watched his East Fife players grow stronger the further Saturday’s Kingdom derby went on and hailed their fitness levels. Raith Rovers looked to be hanging on to a 1-0 victory until the closing few minutes of the game when they fell away rapidly and East Fife’s superior fitness helped them grab a late win. A tiring Rovers defence conceded first from Kevin Smith and then Aaron Dunsmore in the final seconds. Young said: “At half time we spoke about a few things and wanted to pass it a bit better. “But we were always confident there was something in the game for us. “We were always in the game and won a lot of the second balls and got high up the park. “The players train hard for an hour and a half with us a couple of times a week but they deserve credit for keeping their fitness up. “You see it in the 90th minute with Mark Docherty, who has been injured, high up the park, chasing down and winning the ball back and finding Scott Agnew who’s in the right place again. East Fife will be aiming to build on the weekend’s momentum when they make the visit to meet Airdrieonians. The Diamonds are in a group of sides all looking to claw back ground and muscle into the top four. “They have a new manager so will still be getting a boost from that,” said Young. Brett Long, sent off at the weekend, will miss out on Saturday and will be replaced by Craig McDowall. Rory Currie should be available.